Happy St. Patrick's Day! 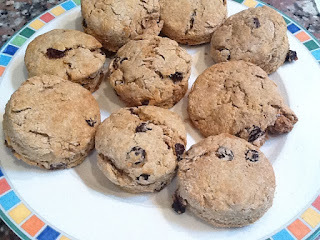 Here's a recipe for Irish Soda Bread Biscuits that's yummy, and fun to make with your little ones. I found this recipe on foodnetwork.com. I changed a few things to make it a little healthier. I used whole wheat flour and regular milk instead of white flour and buttermilk. My little guy and I had so much fun making these yesterday and he ended up loving the biscuits! He ate 2! These are for little ones old enough for finger food. Preheat oven to 375F. Mix 2 cups flour, 2 tsp sugar and 3/4 tsp each baking soda and salt in a bowl. Work in 2 tblsp diced cold butter by hand. Add 1/2 cup raisins. Mix in 3/4 cup milk, you can add a little more if the dough seems too dry. Knead batter with hands until you get a nice dough. Pat out the dough until it's about 1 inch thick. Cut dough into rounds. I used a small juice glass to cut out the biscuits. My little guy loved pushing it down into the dough. Spray baking sheet with cooking spray and place biscuits on tray. Place in oven and bake for 15 to 20 minutes. I baked mine for 18, I think closer to 15 would be better. Let cool and enjoy!